I’ve enjoyed my time off from gaming, but I knew I had to try Starcraft 2 when it came out. One of the first things my husband introduced me to when we started dating was Warcraft 2: Tides of Darkness. This started my love affair with Blizzard’s series of real-time strategy games. I have liked each of Blizzard’s RTS titles, from Diablo to Starcraft and the aforementioned Warcraft series. Starcraft 2 is an amazing addition to the Blizzard RTS family. The graphics are top notch, and a huge, huge upgrade from the previous Starcraft. But as I am playing the game, I cannot help but think: parts of this storyline seems awfully familiar. I’ve been having fun with it so far, replacing “Dominion” with Firefly’s “Alliance,” and Jim Raynor, leader of the resistance, for Malcom Reynolds, the pilot of Serenity. There is even a mission with trains! 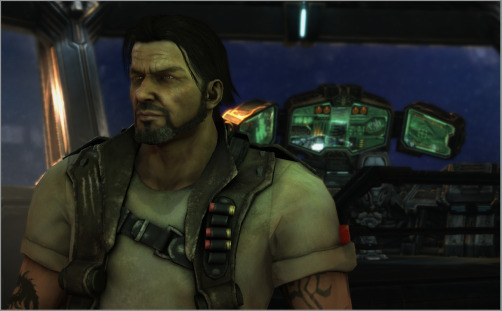 Raynor kind of looks like Mal, if you give Mal a beard and about 20 years. Once you leave the Mar Sara missions it loses the Firefly feeling. I loved the storyline and cannot wait for future installments. This entry was posted on Tuesday, September 28th, 2010 at 6:53 am	and is filed under Starcraft 2. You can follow any responses to this entry through the RSS 2.0 feed. Both comments and pings are currently closed.